Every citizen knows it: The citystate of Thandar is the lynchpin holding the peace together. The metropolis’ rich culture and flourishing commerce encourages imperials, elves, orcs, and everyone in between to resolve disputes through trade and diplomacy – rather than through war, as it was in ages past. But now, a hidden evil threatens to destroy this great city. Strange things are happening in Thandar and the surrounding countryside. Strangest of all might be the fact that an entire nearby village has just … vanished. Only you and your band of heroes can root out this evil – before Thandar is lost, and the world plunges back into conflict and blood. Prepare your party for the Hero Realms: Journeys Kickstarter from White Wizard Games coming in early November. We’re bringing you an experience that combines the storytelling and teamwork of an RPG with the strategy and quick-start play of a deckbuilding game. What will I get when I back the Kickstarter? 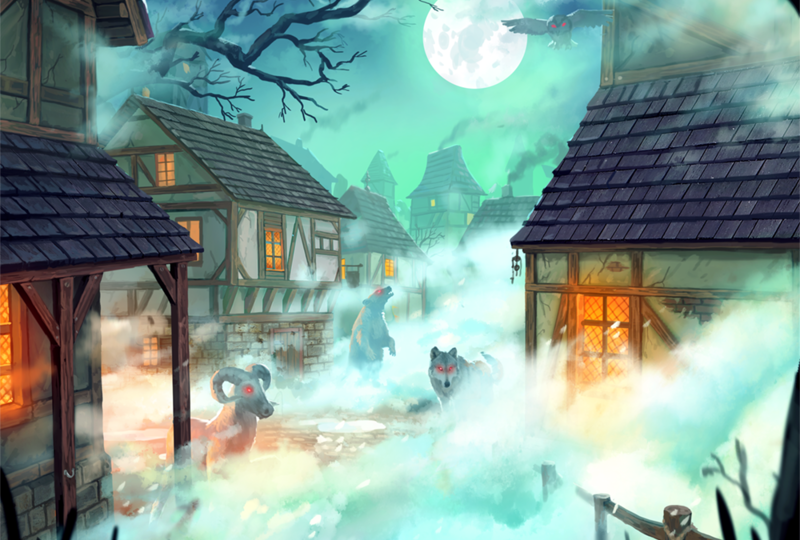 The Hero Realms: Journeys Kickstarter will include a three big new things. Together, these will help you and your party to set off on your deckbuilding adventure. The Lost Village is the sequel to The Ruin of Thandar, the first chapter in the Hero Realms leveling cooperative deckbuilding campaign. If you haven’t yet played The Ruin of Thander, get it at your local game store already, it’s awesome! The second big thing of the Kickstarter will be a series of four new 12-card Hero Realms expansion packs. Some will bring you you new Champions and Action cards. Others will feature cool new card types! And the third big thing, well, you’ll just have to wait for the Kickstarter to find out what that is! How can I stay up to date on the campaign, while also doing my good deed for the day at the same time? We’re glad you asked this extremely specific question. We’d like to announce the Be A Hero Sign-up Drive. Our goal here is to donate a lot of games to childrens’ charities, while also building our gaming community. And you can help. Fill out the form here to sign up for updates on the Hero Realms: Journeys Kickstarter. Anyone on that mailing list will get updates, art previews, and lore sent straight to their inbox, oftentimes before anyone else gets it. For every person that signs up for the mailing list (up to 5,000 total), we’ll donate a game to a children’s charity that’s in need of giveaways. So sign up. A child will get a game for free just because you agreed to hear the cool things we have to say about our games. If that’s not enough incentive, signing up for the mailing list also enters you automatically to win a prize. What prize? Well, you handsome devil, practice your best roguish smile, because we’ll be drawing the contest winner into a Hero Realms card. Of course I definitely, absolutely already know what Hero Realms is, but can you explain it for my friend here? Yes, no trouble at all. Hero Realms started with a $550,000 Kickstarter in 2016. The base game supports 2 to 4 people, and it’s player-versus-player. Add some Character Packs, and pick up some Boss Decks or The Ruin of Thandar – then you’ve got a tightly strategic co-op deckbuilder set in a classic fantasy world. As you play, spend gold to acquire new actions and champions for your deck. These cards generate powerful effects, provide additional gold, stun opponents, and deal damage. Reduce your enemy’s health to zero and claim victory. The first campaign was The Ruin of Thandar. You can watch reviews and how-to-plays (for both the base game and The Ruin of Thandar) from a variety of folks, including Rhado Runs Through, Geek & Sundry, The Dice Tower, and Watch It Played. I like that. How else can I learn about this realm of heroism? We’ve got a Facebook page, a Twitter, and an Instagram you might like. We post almost exclusively about games, including this one. Someone who likes Hero Realms made this Reddit page. You can follow us on Kickstarter. Or you can introduce your carrier pigeon to our carrier pigeon (his name is Jerry, and you’ll know him when you see him). 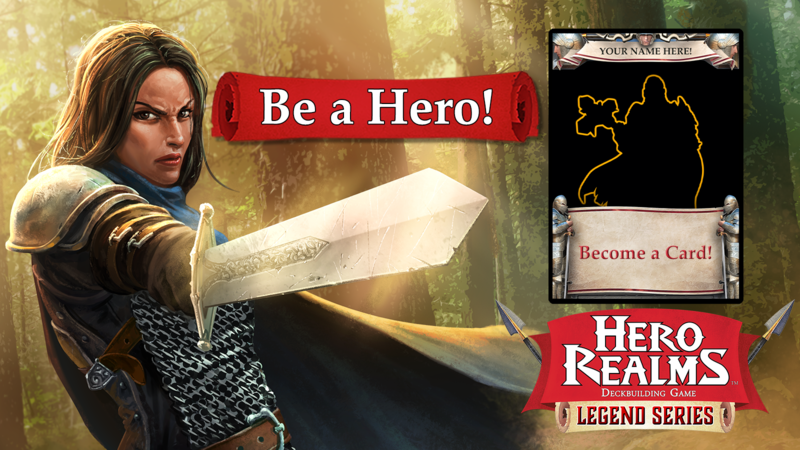 So Be a Hero and sign-up to get our Hero Realms Kickstarter emails now!